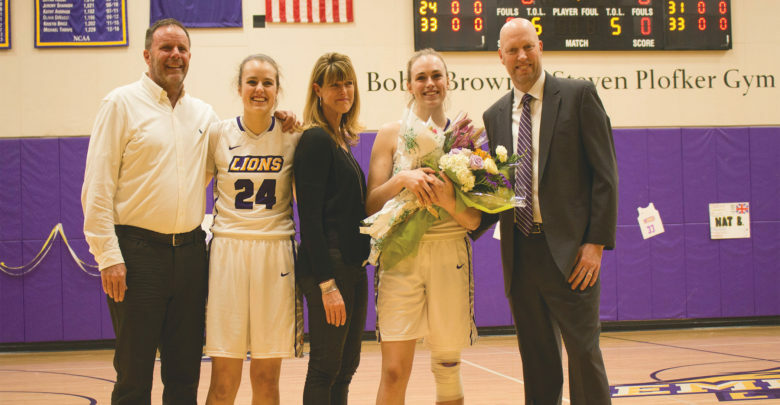 The women’s basketball team honored forward Charlie Boyle and guard Natalie Busch on senior day and extended the Lions’ five-game winning streak with a 61-55 victory against Worcester Polytechnic Institute on Wednesday night. Prior to tipoff, the two seniors took to the court with both their family members and head coach Bill Gould to take pictures while an announcer detailed their accomplishments on the team. As Boyle and Busch received introductions into the starting lineup, prolonged cheers from the home crowd followed. Boyle—a visual and media arts major from Scotts Valley, California—immediately established herself as an integral part of the team by averaging 12.4 points in her first season. In over 92 games played, she averaged 12.2 points and 4.9 rebounds on a 52.1 percent shooting from the field. On Jan. 12, Boyle became the fifth woman in Emerson basketball history to pass the 1,000 point milestone. Busch—a visual and media arts major and former Beacon editor from Weybridge, England—played in a total of 90 games and averaged 6.8 points, 2.7 rebounds, and 2.2 assists on a 36.8 percent shooting from the field. The Lions began the game by overwhelming WPI with four steals and ended the first quarter with a 12-5 lead. Emerson continued to outscore WPI in the second quarter by making seven of their 13 field goal attempts before leading 27-19 at halftime. The Engineers took their first lead of the game with an 11-2 run to start the second half. Emerson persevered and regained the lead 13 seconds later with a layup by Boyle. The third quarter had a total of five lead changes and the game tied 41-41 at the start of the fourth. Both teams struggled to score at the start of the fourth quarter. After falling behind, Emerson regained the lead with a three-pointer from junior guard Natalie Clydesdale and a jump shot from Boyle. The Lions held the lead for the rest of the game and won 61-55. Boyle, who recorded a game-high 18 points, said senior day signaled an end to her playing career. Busch played 20 minutes on senior day and finished with four points. She said she is excited about how the team improved over the years and looks forward to the playoffs. In a post-game interview, teammate Quinn Madden, who ended the game with 12 points and seven rebounds, praised Boyle and Busch. Gould said the team must prepare for the postseason. “We just want to play hard, play well, and get ready for the playoffs,” Gould said. In their final regular season game, Emerson will look to continue their winning streak on the road against Mount Holyoke College on Saturday, Feb. 23 at 1 p.m.